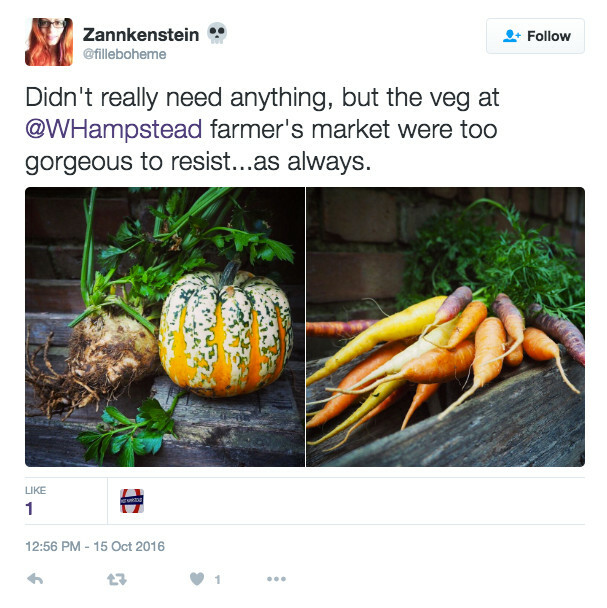 West Hampstead Life | What have you missed since Oct 3rd? Fittingly during ‘National Hate Crimes Awareness week’, the LGBTI rainbow flag flew again over West Hampstead, thanks to the help of the fire brigade. The story was featured on Channel 4 news and BBC local news. WHL guest writer Shalini gave us her take on West End Lane’s brunch options. And apparently new-kid-on-the-block One Bourbon offers another one – with pulled pork! Firezza pizza delivery is set to open on Monday but some lucky West Hampstead residents got free delivery of pizza on Saturday as a trial run. Keeping up the healthy theme, WHL popped in to chat with Peppercorns about Manuka honey and gentrification. Popular local live music (and comedy) venue The Good Ship in Kilburn is under threat as police are questioning its licence hours. John, the owner, says that problems have been exaggerated and will be making a strong case to Brent’s licensing board. It does seem ironic that just as we get the late tube venues are being made to close earlier. Watch out – very closely – for some very small artworks appearing around West Hampstead. Lots of activity on West End Lane over the past weekend. On Friday Salt (formerly Lower Ground Bar) reopened. And on the same night just up West End Lane, after a very rapid refit, OneSixty became One Bourbon . There was a successful Whampsocial at the Green Room on Fortune Green, which is apparently doing good Sunday roasts. Still nothing on 156 West End Lane (aka Travis Perkins), but expect something very soon. Over on the Finchley Road – at 317, Camden’s planning officer has recommended approval- of ten, count ‘em, ten stories. Care about the future of West Hampstead (part 1)? The NDF is organising a workshop on the Growth Area next month (see diary), it will be discussing masterplanning issues. If you want to have your say, put the date in your diary. Care about West Hampstead (part 2)? There are still estate agent’s boards on West End Lane despite the ban and a number of banners too. Plus A-boards on the pavement. Time for a crackdown? Care about West Hampstead (part 3)? And what about the terrible state of paths by the railways? Time to put pressure on Camden and Network Rail? Last weekend Pro- and anti-CS11 (cycle superhighway) protestors demonstrated outside the Hampstead Theatre, pros outnumbering the antis. It’s on the edge of West Hampstead but could still affect us. Heavy traffic on the Finchley Road Sunday afternoon swiftly bunged up West End Lane. Building continues apace on the extension to Kingsgate School in Liddell Road as shown in this video. It should be opened by Sept 2017 and for all you parents looking for a school place, applications have opened via Camden Council. Is it just me, or do there seem to be a lot of burst water pipes in the area? After none for ages, there are now several. I’m wondering if Thames Water has increased the pressure? Or is it do with the arrival of autumn? Or just chance? Keeping up the pressure for the release of Nazanin Zaghair-Ratcliffe, this week a UN working group found her detention was arbitrary and that she was denied a fair trial. In another guest article, Tom Bullock gave us an insight into West Hampstead Hockey Club, right on our door step, with a report on the 1st team’s recent match at Blackheath. Congratulations to local author Susie Steiner who is bouncing around the Sunday Times top ten fiction chart for her thriller ‘Missing Presumed’. (Following in the footsteps of another local author Renee Knight who was there earlier in the year for her thriller ‘Disclaimer’). Copies of both are available at West End Lane books.